← GI Joe Renegades: all a dream? For all the technical details on the sculpt (absolutely no complaints) and the articulation (there's plenty of it, and it all moves perfectly), please visit our Scarabus review - this review is just about the differences on one specific variant. Okay, enough with the aliens - let's get to the good stuff. Today we take a look at Anubos, the least "variant-y" of all the variants. 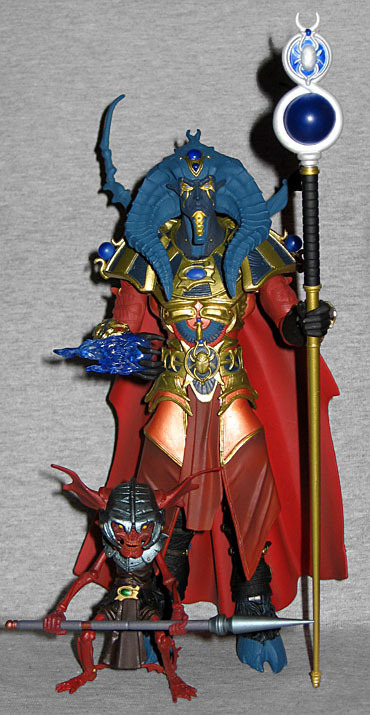 His colors are almost identical to Scarabus': red and black clothes, gold and blue armor, etc. The colors are slightly darker, but that's all. His accent color (the one used for his gems and the hand-flames) is a nice dark blue. His staff is golden, but the interchangeable tips are silver. 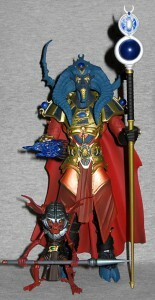 His Timekeeper accessories are metallic blue, like Demon Fire Scarabus' were. We certainly shouldn't need to explain to you who Anubis is. Even if you've somehow managed to avoid the prevalance of Egyptian mythology references in popular culture, we gave you a primer on him ourselves! This variant has dark blue horns and hooves, and the cracks around his eyes are golden. The alternate Anubos head is, of course, dog-like, with a long, pointed snout and tall ears. The second face is darker blue with golden accents, which looks very nice. To help the new face blend into the head, there are two additional small horns coming down alongside his cheeks. And I can't believe I didn't notice this before, but the design of Scarabus' horns, ridged as they are and falling down over his shoulders, is meant to suggest the nemes headdress! Holy crap, that's clever. Since Scarabus has such a strong Egyptian influence, it makes great sense to use his variants to give us some pseudo-Egyptian gods. 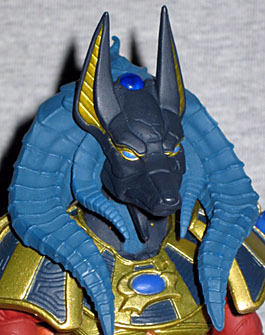 And if you're making pseudo-Egyptian gods, Anubis is a great one to go with. And as far as toys go, Anubos is very nice. His colors could show more difference from the standard figure's, but by being so similar it makes Anubos look like an equal to Scarabus.